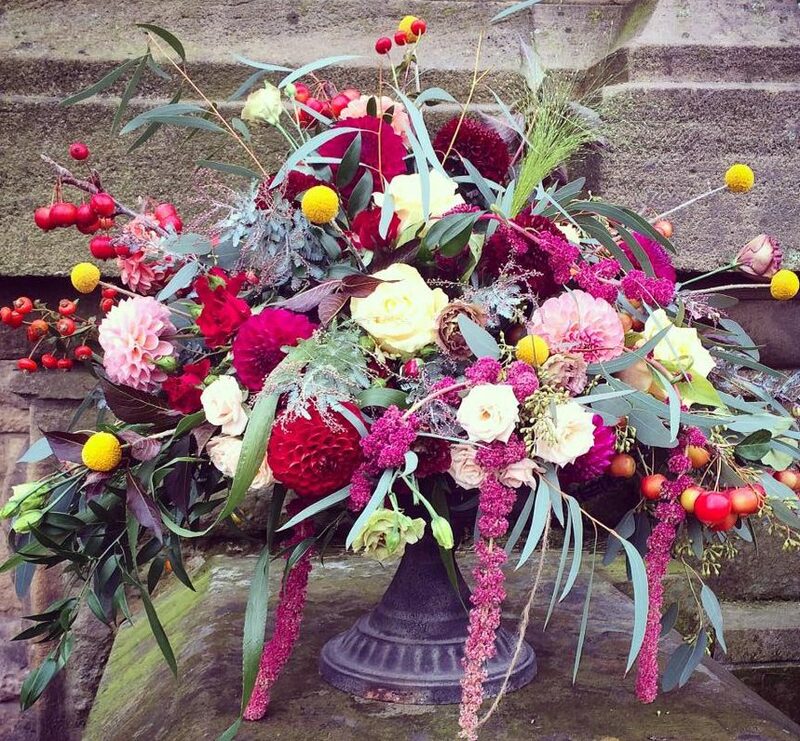 On Saturday I broke free from pastel shades and did a gorgeous, rich, vibrant autumnal wedding. Zhenya and Gareth got married locally at Victoria Hall in Saltaire. They asked for seasonal flowers in bright autumn shades. I won’t lie, I’m not one of these florists that claims to always use local blooms. This takes a lot of work and a large plot of land that need a lot of work to maintain. I admire people who do this and I think it shows great passion for your craft. I have my own gorgeous back garden which I use from time to time for my work but I really like to keep it for me and my family to enjoy. I do try to balance between flowers bought from the auction in Holland and those that are UK grown. This week I was donated my dahlias from a local allotment grower and they were spectacular! He inherited his plot from a man who spent many years successfully showing these beautiful blooms (they have a reputation for being old-fashioned but I confess are probably my favourite ever flower!) Dahlias are thought to be very tender flowers and the tubers should be lifted over winter. They babies have been left in the ground for 3 years untouched and are still flowering amazingly into mid October! They completely made the wedding and Zhenya was absolutely thrilled with her flowers..